Agency The Bluehat Group has created four new teambuilding experiences following the launch of new division, Bluehat Develops. The four new teambuilding products, which include FreshBiz, Beat the Box, Puppet Masters and Funk the Junk, bring Bluehat’s total number of products to 127. The release of the new activities comes shortly after the agency launched its new division, Bluehat Develops, which focuses on delivering leadership development and learning experiences to millennials. The new division contains the new FreshBiz teambuilding tool, a proactive training device and game. 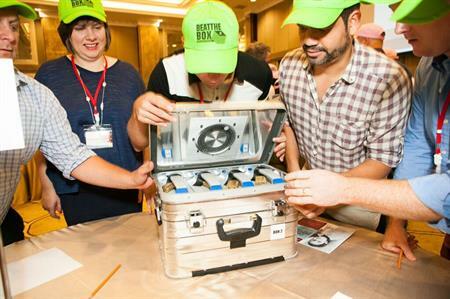 For the Beat the Box activity, teams are presented with a series of locked boxes and have to solve challenges and clues to open them and solve the riddle. Funk the Junk has teams playing recycled trash instruments tuned to each other, while in Puppet Masters team members must work together to build 10ft high working puppets, which then must be manipulated to perform different actions. Commercial director at Bluehat, Ben Parkinson, said: "As innovators in the teambuilding sector for over 15 years, it’s important to us that we continue to raise the standard of what is available in the market. With our desire to offer our client base the widest range of interesting and challenging experiences, we’ve just introduced these four new experiences for 2016."